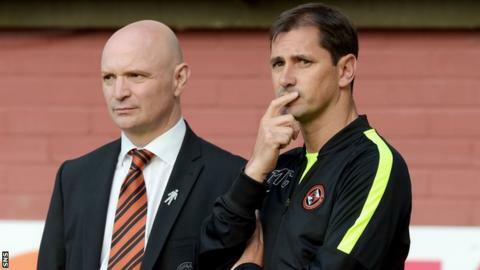 Jackie McNamara's time as manager of Dundee United is over, BBC Scotland has learned. The former Scotland defender, 41, met with chairman Stephen Thompson following Saturday's 2-1 defeat to 10-man St Johnstone in Perth. McNamara remains an employee of the Tannadice club but will not be in charge for next Saturday's visit to Partick Thistle. United sit second bottom of the Premiership with one win from nine. The visitors took the lead at McDiarmid Park when Billy McKay converted a first-half penalty after a red card for Saints keeper Alan Mannus. However, the depleted hosts hit back after the interval, with goals from Graham Cummins and Simon Lappin. Club officials confirmed that McNamara had talks with Thompson after the game but would not reveal any details of those discussions. McNamara joined United from Partick Thistle in January 2013 and led the team to two cup finals. He is contracted until the summer of 2017 after signing an extension in February 2014.